With what do you write – pen, typewriter, computer or …? My draft of my entry for the Ilkley Literature Festival, handwritten with the ‘new’ blue and black fountain pen. It was only copytyped on the iPad when finished, a couple of hours before the ‘performance’. I’ll hopefully get the two ‘attic gems’ working soon. I just made a breakthrough in my writing. I picked up a fountain pen. I had not handwritten anything other than short notes since writing to my mother when I was first in Romania in 1993 and had no access to a computer; even then it was with a ballpoint. I found it very difficult, having been used to a computer for the previous ten years, and a typewriter before that, since becoming a journalist in the early ‘60s. What prompted me to move to handwritten was the reaction of my former student Paula, now a Romanian high school teacher of English, to a handwritten note included in a packet I sent to her (one of my ‘attic gems’ – a special English course I wrote when teaching in Romania). She said it was wonderful to receive a handwritten ‘letter’. I promised to ‘keep in touch’ with handwritten letters from time to time (among brief encounters on Messenger) and as two more of my ‘attic gems’ were fountain pens I decided to go the whole hog and go to fountain pen. The two old ones were not working (I intend to fix them) so I acquired a new one. Having begun the first letter to Paula during the time I had to write my contribution to our writers’ club ‘performance’ at the Ilkley Literature Festival, I began to scribble my ‘poem’ in a primary school exercise book with the fountain pen. What a transformation! Firstly, the ideas tumbled out like never before. Secondly, I began to do something I’ve said I almost never do – edit what I’ve written, neither during nor after writing (this comes from journalism where I almost always had no time to edit – often writing as many as 60 stories a week including one or more long features). 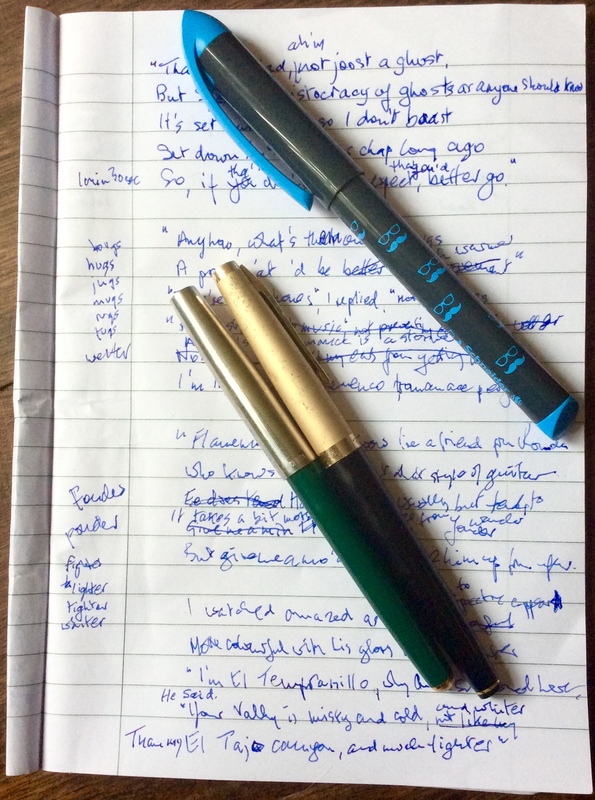 With the fountain pen I found myself crossing out, writing alternative lines, jotting down ideas as they came, making lists of rhyming words as I was following Lewis Carroll’s ABAAB rhyming scheme. All very strange to me. Now, the urge to write ‘creatively’ is far stronger with a fountain pen in my hand. I wonder if this will bring my ‘novella’ out of it’s long hibernation. Or even extend it to be a novel. This writing by hand doesn’t extend to what you might call ‘non-creative’ writing, like writing blog posts. Those are still written on the the iPad (more rarely on the MacBook). So this post is written on the iPad, as will be most future posts, but if they include some ‘creative writing’ you can be pretty sure that will have been written first on paper, with a fountain pen. The only disadvantage of writing by hand is that to include hand written pieces in something ‘digital’ they have to be typed up on a digital device. PS. My first, 10 page, letter to Paula, composed over a couple of weeks, was posted on Saturday morning. I’d be really interested to hear from others whether the medium with which they write influences their writing, particularly use of a fountain pen (or not). You can read my finished ‘poem’ on a previous post, or hear me read it on the post of 5 October. 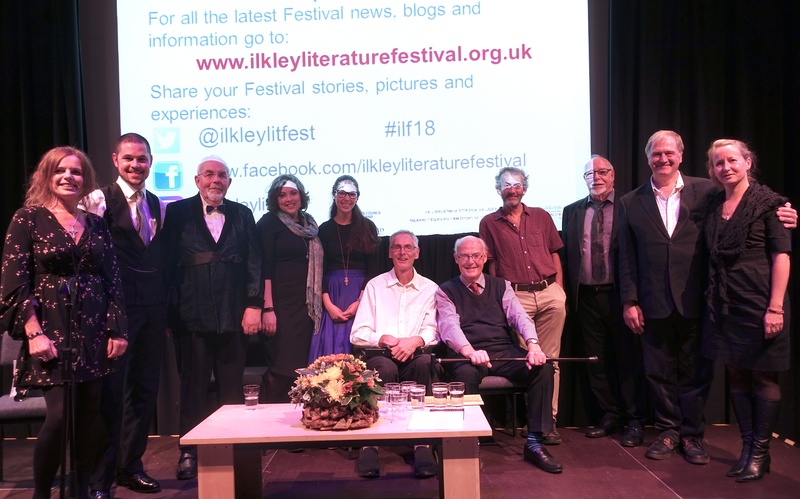 Presenting as part of the main Ilkley Literature Festival, one of the premium literature festivals in the UK, has to be a high point in the life so far of our local writers’ club, Writing on the Wharfe. In the previous two years we have done a performance as part of the ‘Fringe’. However, I doubt our wonderful founder and leader, Ruxandra Moore (neé Busoiu) will let us rest on our laurels. Full of energy and enthusiasm, she’s dragged us, sometimes screaming, from maybe half a dozen aspiring writers meeting in an Ilkley coffee bar to a group of around 20 confident enough to take to a stage occupied at other times during the Festival by some of the best writers in the country. Our Festival performance, titled ‘Evocation’, follows two broadly similar performances in Leeds Art Gallery earlier this year – eight writers from the club presenting a story or poem evoked by a painting in the gallery then an astounding flamenco guitarist, Samuel Moore, improvising music evoked by the picture and the words. Then I chose to write a short story, inspired by the Brontë sisters, particularly Emily. For the Festival performance, on Saturday evening, we had just four pictures, photographs taken by a club member – Robert (Bob) Hamilton – of scenes around Ilkley, projected on a large screen behind us. Two writers presented in about four allocated minutes what one of the pictures evoked for them. Samuel then played what those two pieces and their picture evoked for him. Many thanks to Petronela Prisca for the photographs and a video of the whole one hour ‘performance’, which I hope I can feature sometime in the future. I was lucky in that I was ‘on’ second so could then relax and enjoy the others. My ‘partner’, Kayla Herbert, opened the ‘performance’ with a delightful short poem about witches. Its brevity allowed me a little over my four minutes. Again inspired by a celebrated author from the past, but secondly also by a modern Yorkshire poet with whom I spent a great time on a barge on the Leeds-Liverpool canal in Leeds a couple of years ago, Matt Abbott. 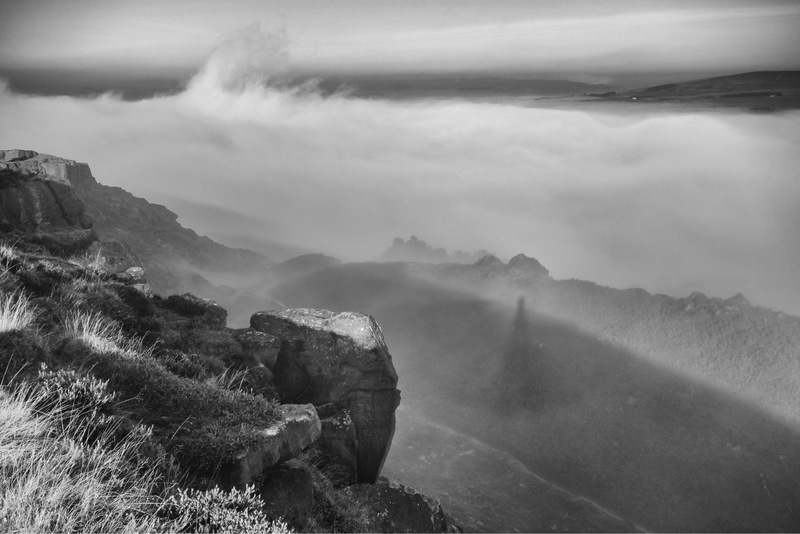 I chose to attempt to parody a poem, Phantasmagoria, by the first – no lesser person than Lewis Carroll – my spectre speaking in Yorkshire dialect. I’d never attempted such a parody before. My ‘poem’ presented at the Festival and the photo is below, with ‘translation’ for those who don’t understand my attempts at Yorkshire dialect. 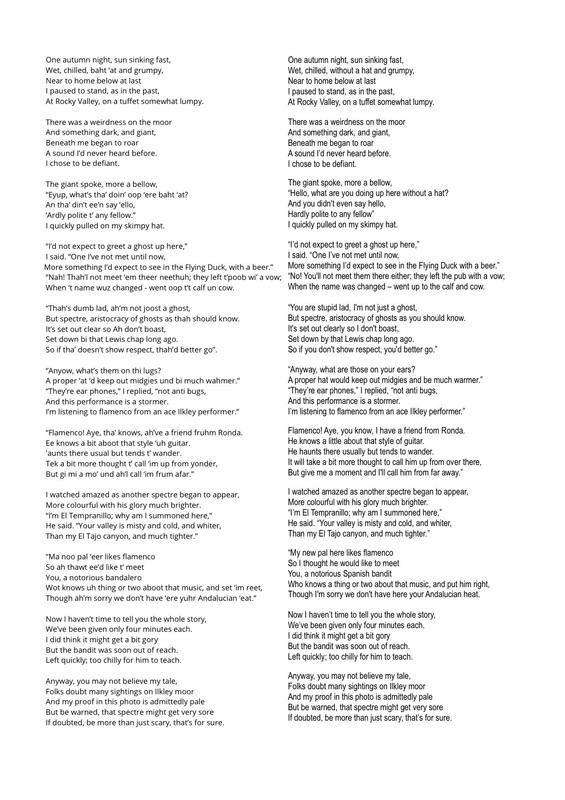 (Click twice to magnify it enough to read). Apologies to Lewis Carroll of course. Phantasmagorias were a popular Victorian entertainment, where ‘scary’ images – ghosts, skeletons, etc were projected onto a screen, much like our Festival presentation but, of course, a different, earlier, ‘technology’.